Clinical research professionals must be fully equipped with all the skills, tools, knowledge and proficiency in best practices in project management techniques, clinical research and more specifically Good Clinical Practices. The CRS GCP Certification program offers one of the most robust and comprehensive GCP training and certification available. Based upon the acute necessity of GCP knowledge and skills in the research enterprise, upon recommendation of the CRS Executive Committee, GCP Training and Certification has been made available to all CRS Professional members of the Clinical Research Society as a membership benefit. The GCP Training & Certification program is also available to CRS Non-members. 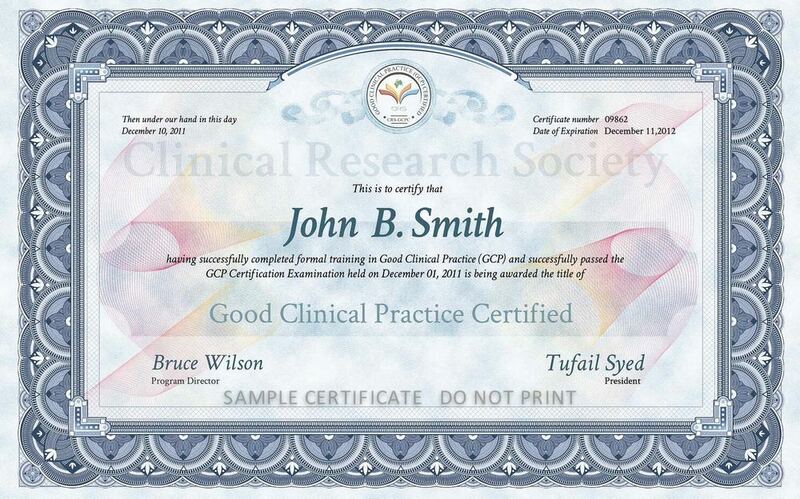 Every clinical research professional who has obtained or is about to graduate with some type of life science degree or certificate that they earned online or at a local campus must have a comprehensive knowledge of Good Clinical Practice (GCP) regulations and guidelines, both local as well as international. What this means is that if you just completed your higher education such as a Masters in Pharmacology or a Masters in Nursing and are looking to be a part of any clinical research team, you need to be knowledgeable of their guidelines to be considered for a position. Organizations conducting clinical trials on a pharmaceutical, biotechnology or medical device products intended for submission to a regulatory authority are required to follow GCP guidelines. Standards are enforced by periodic inspection by regulatory officials of the country where the clinical trials are carried out or where the data is submitted. 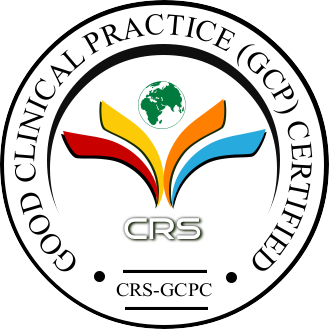 GCP Training & Certification Program is available as a membership benefit to all “Professional Members” of CRS. All professional members are automatically enrolled in this program after they apply for CRS “Professional Membership’ . The GCP Training program is offered through a state-of-the-art learning management system that is programmed to create a pedagogical approach to the delivery of the training. The curriculum and the content of the GCP training has been developed by trained and experienced professionals from the clinical research industry with an extensive input from academia, and other relevant domains. Training is delivered through multimedia presentations, case scenarios and other useful resources. Our endeavor is to make the learning effective albeit easy and convenient. One of the most important features of the GCP Training program is that it is self-paced and can be accessed by the member at any time until the Certification Examination. CRS has partnered with ProctorU to offer proctored exams for all Certification Programs. To ensure integrity, security & consistency of the examination process, real people oversee proctored exams. Proctored exams are a required component of the certification programs at CRS. You can schedule an examination at your convenience after registering for the exam and paying the examination fee of USD 18/- on the CRS website. Scheduling of examinations with proctorU will not incur any additional cost unless the exam is scheduled within 3 days of the date of scheduling. The GCP certification exam will be of 1 hour duration. ProctorU is an inventive new service that allows individuals all over the world to take their exams online while ensuring academic integrity for the institution. ProctorU uses a three-step process to replicate the face-to-face proctoring experience over the Internet. Through this process, proctors can see the student, observe their computers, and know whom they are monitoring. ProctorU does this while adhering to the highest accreditation standards in the industry. ProctorU is a pioneer in the industry and serves close to 100 partnership institutions including Northwestern University, the University of Florida and the University of Illinois. You can find more information on ProctorU here. While the training provided though our GCP training program is extensive and broad in scope, members are nevertheless tested on their understanding of GCP based upon other resources that he/she may have been directed to during their training. These resources may include the FDA website, international and/or local policies, regulations, and guidelines, best practices, etc. We provide an exhaustive list of such resources through our Learning Management System. From 01 April 2018 CRS only issues soft copies of certificates. These are sent to the applicant’s email usually within 2 weeks of certification exam. The GCP certification stays valid for 1 year from the day of passing the GCP certification examination. Recertification can be achieved through a re-examination that can be scheduled through the Training Portal when it is due after paying the Certification fee. For CRS Non-Members: Fee varies between USD 95/- and USD 120/- based upon the nationality of the Non-Member. GCP Certification is available to Professional Members as a part of the membership benefits. If you are an Associate Member, Student Member, or not a CRS member, you can apply for GCP Certification by choosing your member status below.